Because walking is a natural thing to do you can just go off and do it. However, the Ramblers has brought together years of experience on its website. So for more information on everything you need, click Getting going. If you want to walk with a group, then check out our information on the groups in Kent by clicking here and choose a group or walk appropriate for you. Some groups tend to have longer, faster walks, others have shorter or slower ones. Some have a few pub stops and others do not. To find out more information on the footwear and feet care, clothing, equipment, safety and security, body matters, natural hazards, suggested reading and courses, click on the links on the left. Whether you walk on your own, or with a group, there are some things you must consider. All these will be found on the main Ramblers' site. You will also need to know where you can walk legally. Unless you are following a group, such as the Tunbridge Wells Ramblers, so you will need a map and a compass. You will also need appropriate footwear and clothing, a rucksack, as well as food and drink. Rather than spend a lot of money, especially on boots which may not be right, check out the following guidance then join a short group walk. You will find our members more than happy to give advice to those new to walking. 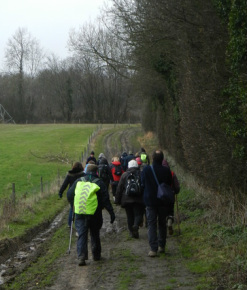 The Kent groups put on a wide range of walks, some of which you will need to be very fit to complete and others are available for those less fit or for beginners. We have regular walkers with quadruple bypasses, artificial hips and many in their 70s and 80s. To find out if a walk is suitable for you, contact the leader and ask. By arranging transport with a friend you could do half a walk, leaving part way though. If you are not yet a member of the Ramblers you are welcome to join the Tunbridge Wells Ramblers for 3 or 4 walks to decide if you want to join. Ask the group of your choice for a programme of their walks and off you go. We love our walking. We are sure you will too. How to join.